Mercedes-AMG E 63 S 4MATIC+ | Rule On. The exterior of a Mercedes-AMG is required to combine striking design with Driving Performance. The Mercedes-AMG E 63 S 4MATIC+ fulfills this function particularly effectively. The powerdomes on the inboard hood, which is familiar from the Mercedes-AMG GT, and the flared wings highlight the power that is on tap in the E 63 S. Apart from their dynamic looks, the particularly low air inlets also provide for a controlled air flow – in pursuit of maximum Driving Performance. Dynamic design features define the exclusive character of the Mercedes-AMG exterior. Defining features of the signature AMG front with pronounced V-shape are the inserted AMG hood with powerdomes, the AMG front apron in Jet Wing design and the AMG radiator grille with twin louvre in silver chrome, vertical black struts and "AMG" lettering. AMG radiator grille and AMG front apron feature air inlets devoid of grilles to open up the third dimension and reveal the sophisticated cooling technology that lies within. The front splitter in silver chrome visually distinguishes the S-Model front from the E 63. The side design boasts 50.8 cm (20-inch) AMG 5-twin-spoke light-alloy wheels, in matte titanium gray and featuring a high-sheen finish, characteristic AMG wings featuring "V8 BITURBO 4MATIC+" lettering with trim element and AMG-specific side sill panels with inserts in silver chrome. The sprightly rear end rounds off the exterior appeal to perfection, featuring the AMG sports exhaust system with two chrome-plated twin tailpipe trim elements in S-Model-specific design and the AMG rear apron with three diffuser fins and a trim strip in silver chrome. As standard, the Mercedes-AMG E 63 S runs on tires of sizes 265/35 ZR 20 (front) and 295/30 ZR 20 (rear) mounted on 9.5 J x 20 (front) and 10 J x 20 (rear) 5-twin-spoke light-alloy wheels, painted matte titanium gray with a high-sheen finish. Optionally, 50.8 cm (20-inch) AMG 5-twin-spoke light-alloy wheels painted in matte black and with a high-sheen finish or painted in titanium gray and with a high-sheen finish are available. Furthermore, 50.8 cm (20-inch) AMG cross-spoke forged wheels painted in titanium gray and with a high-sheen finish or painted in matte black with high-sheen rim flange are available as optional extra. Front axle: composite brake disk measuring 390 x 36 mm, internally ventilated and perforated with six-piston fixed caliper. Rear axle: composite brake disk measuring 360 x 26 mm, internally ventilated and perforated with one-piston floating brake caliper. Extremely short stopping distances, precise pressure point and outstanding fading resistance even in extreme operating conditions – the AMG ceramic high-performance composite brake system offers racetrack-braking performance accompanied by weight savings of around 40% over conventional composite brake discs. Front axle: composite ceramic disc, diameter 402 x 39 mm, with six-piston fixed caliper, internally ventilated and perforated. Rear axle: composite disc, diameter 360 x 32 mm, with four-piston fixed caliper, internally ventilated and perforated. - Bronze-painted brake calipers with "AMG Carbon Ceramic" lettering. If desired, the AMG Night Package Exterior underscores the sporty and expressive character of the vehicle with striking design elements in black. High-gloss black front splitter in AMG front apron, inserts in the AMG side sill panel in high-gloss black, trim element in the front wings in high-gloss black with "V8 BITURBO 4MATIC +" lettering, exterior mirror housings in high-gloss black, shoulder line trim strip and window frame in high-gloss black, heat-insulating dark-tinted glass starting from the B-pillar, AMG sports exhaust system with two black chrome-plated twin tailpipe trim elements and high-gloss black trim strip on the AMG rear apron. 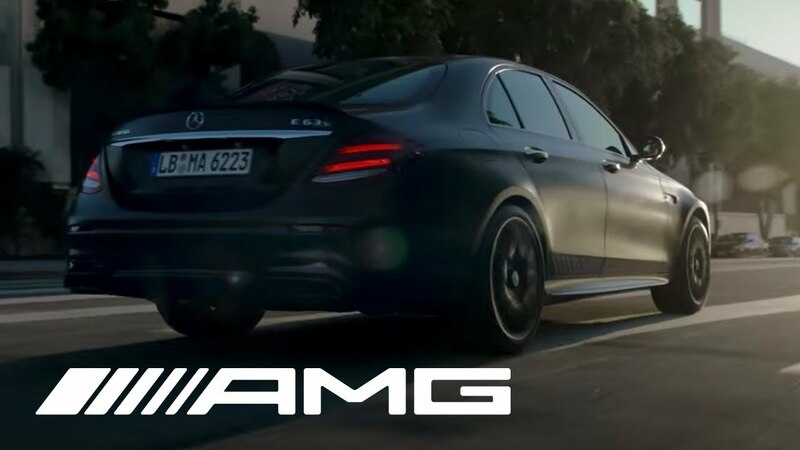 Furthermore, the AMG Exterior Carbon Fiber package I and II with sporty details in carbon fiber lend the vehicle a markedly more dynamic character. Front splitter in the AMG front apron in carbon fiber, inserts in the AMG side sill panels in carbon fiber, insert in AMG rear apron above rear diffuser in carbon fiber and trim element in the front wings in carbon fiber. At the limits is where you have to pay the most attention and make the clearest statement. The interior of the Mercedes-AMG E 63 S 4MATIC+ is designed such that all the components contribute to a highly dynamic experience. The widescreen cockpit, the AMG Performance steering wheel and the AMG sports seats with optimized lateral support and embossed AMG crest on the front head restraints conjure up an exclusively sporty character. All to serve the purpose of an even more intensive Driving Performance experience. The sporty high-quality interior comprises as standard such appointments as sports seats with optimized lateral support and AMG badge in the seat backrests, AMG Performance three-spoke steering wheel with flattened bottom section as well as an AMG instrument cluster with AMG main menu including RACETIMER and AMG start-up display, showing valuable information for sporty drivers presented in inspiring AMG design. With the RACETIMER it is possible to measure lap times. Individual flair is added by fine aluminum trim elements and the AMG brushed stainless-steel sports pedals with rubber studs. Exclusive design features further refine the Mercedes-AMG interior for the S-Model. As exemplified on the sports seats by the upholstery in AMG Exclusive nappa leather with contrasting topstitching in crystal gray and the embossed AMG crest on the front head restraints. The AMG Performance steering wheel is even sportier, courtesy of grip areas in DINAMICA microfiber and a "12 o'clock marking." The upper part of the instrument panel and the beltlines on the doors sport a particularly classy finish in black nappa leather with contrasting topstitching in crystal gray. A further highlight is the widescreen cockpit with a screen diagonal of 2 x 31.2 cm (12.3") and AMG main menu including RACETIMER. The AMG-specific analogue clock in IWC design and seat belts in crystal gray round off this exquisite interior. Best possible lateral stability for dynamic driving, optimal adaptability to the driver with adjustable side bolsters. Pneumatically adjustable side bolsters in seat cushions (only in the driver’s seat) and back rests (only in conjunction with leather optional). Seat cushion height adjustment for comfortable thigh position, a steeper seat angle provides leg support. AMG badges in the back rests and an AMG coat of arms stamped into the front head rests. For outstanding vehicle control, the AMG Performance steering wheel in nappa leather/DINAMICA microfiber features a flattened bottom section as well as grip areas finished in DINAMICA microfiber. The sporty design is completed by silver-colored aluminum shift paddles and a 12-o'clock marking. To achieve your aims, you need to apply your energy in a purposeful manner. Just like the innovative AMG Performance 4MATIC+ all-wheel drive system. The fully variable torque distribution – from all-wheel to rear-wheel-only drive – provides for excellent traction tailored to the given situation. And this traction is most definitely needed, in order for the immense power distributed by the AMG SPEEDSHIFT MCT 9-speed sport transmission to be applied effectively to the road. The electronically controlled AMG rear-axle differential lock comes into its own in dynamic cornering. The 4.0-liter V8 engine from Mercedes-AMG impresses with explosive power delivery combined with very finely controllable power output. The twin-scroll turbochargers are positioned between the cylinder heads ("hot inside V") for better response. Cylinder shut-off under partial load ensures even greater efficiency. In the Mercedes-AMG E 63 S 4MATIC+ this engine takes peak performance to a new level at 450 kW (612 hp). Maximum torque attains a new best value of 850 Nm. With such an immense power, the vehicle accelerates to 100 km/h in 3.4 seconds from a standstill and reaches a governed top speed of 300 km/h. The performance-oriented all-wheel drive with fully variable torque distribution combines optimum traction, hallmark AMG driving dynamics and the ultimate in driving enjoyment. It enhances driving safety and adhesion on wet or wintry road surfaces while at the same time allowing an emotional drifting experience. This is made possible by the fully variable torque distribution, offering the driver the benefits of all-wheel drive and rear-wheel drive in equal portion. An electronically controlled clutch provides for variable connection of the permanently driven rear axle with the front axle. The ideal torque distribution is calculated continuously, according to the given driving situation and the driver's wishes. This enables a seamless transition from traction-oriented all-wheel drive to 100% rear-wheel drive. In addition to traction and transverse dynamics, the all-wheel drive also improves the longitudinal dynamics of the vehicle for even more dynamic acceleration. Thanks to the fully variable torque distribution, emotional drifting remains possible despite the all-wheel drive. Drift mode can be activated in the "RACE" drive program (only in conjunction with Mercedes-AMG S-Model) via the shift paddles, provided that ESP® is inactive and the transmission is in manual mode. It remains active until the driver switches it off. From a certain set speed, drift mode continuously transfers drive torque to the front axle, in order to increase driving stability. As the speed decreases, the drive force is increasingly directed to the rear axle in drift mode. AMG Electronic Rear-Axle Limited-Slip Differential. The electronically controlled AMG limited-slip differential on the rear axle provides improved traction in every driving situation, especially when the driver adopts a sporty driving style. This is done by reducing the slip on the inside driven wheel. It offers all the advantages of a mechanical differential lock, yet provides even more agility and greater driving pleasure. Beyond this, it also provides increased driving stability in slaloms or when changing lane at high speed. It proves its worth in a wide range of different road conditions, including in difficult environmental situations or weather conditions such as snowfall. Electrically controlled multi-disc limited-slip differential, adjustment is by means of an electric motor. Two control units are used to control the differential, the adjustment request comes from the driving dynamics controller. AMG Active Dynamic Engine Mount. The two basic functions of an engine mounting are to hold the engine in place and to isolate the body as effectively as possible from engine vibrations. Soft mountings are characterized by high comfort and rather poor driving dynamics. On the other hand, hard mountings make for superior driving dynamics at the expense of reduced comfort. This conflict of goals between as soft as possible a mounting for high comfort and a hard mounting for improved driving dynamics is resolved by dynamic AMG engine mountings. They ensure the optimal connection between engine and body in every driving situation to ensure that both goals are achieved. A driving situation detection function correctly assesses the current situation to enable the optimum damping and stiffness values to be automatically selected to suit every driving situation. The basic tuning of the dynamic AMG engine mountings can be decided upon by the drivers themselves by selecting the transmission mode. This applies to transmission modes "C" (Comfort), "S" (Sport) and "S+" (Sport Plus). With the selected transmission mode, parameters such as the characteristics of the engine, transmission, suspension and steering are changed, resulting in an even sportier vehicle setup: more agile accelerator pedal characteristics with a more direct setup, shorter shift times and significantly more emotional gear changes. The dynamic characteristics of the vehicle are supported by additional functions such as a double-clutching function, cylinder shut-off, active downshifting and quick accelerationfrom rest in "Sport" and "Sport+" mode. More agility and dynamism are provided by the Sport drive program, whose features include sporty, taut suspension tuning and modified shift points. The sporty attributes can be enhanced even further in "Sport+" driving mode. In this case, the suspension and drive system are even more dynamically tuned. The ECO Start/Stop function and gliding mode are deactivated in both programs. The "RACE" drive program is configured for racetrack performance. It impresses with optimum sportiness in terms of response time, engine speed and shift times. The "Individual" transmission mode enables drivers to adjust the various parameters – from the steering and powertrain to the suspension – to suit their own requirements. The Mercedes-AMG S 63 4MATIC+ Sedan.